Many of the best cuts of the Sienna marbles have historically been reserved for decorative detail, inlay work and fire surrounds. 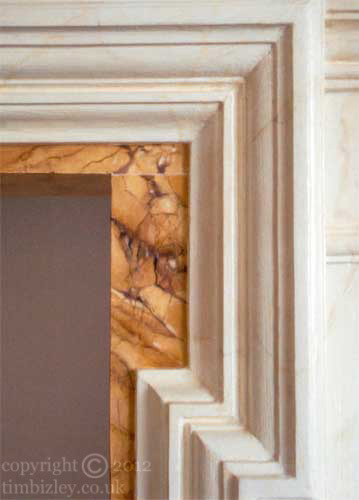 Here a faux marble paint effect on the slip of a Neoclassical fire surround simulates sienna Brocatelle. Fire surrounds are a perennial commission for specialist decorators and have been for many centuries. Countless examples abound of black slate surrounds being painted onto with oil paints, a popular treatment in the Victorian Age.